Hi guys! I've got a whole bunch of pretty things to show you! 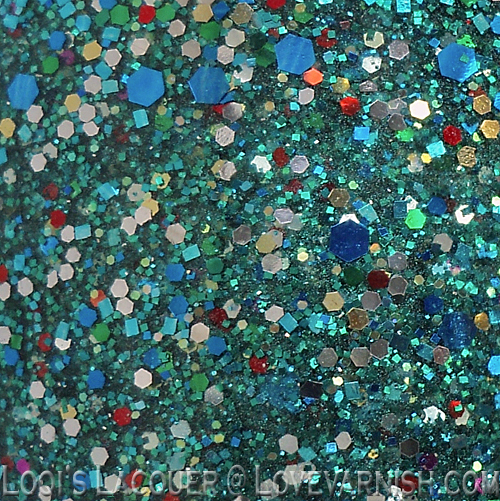 I've got 2 new Shimmer polishes for you this week: Sophie is a very sweet pink and red glitter mix with some iridescence mixed in and Linna is a very pretty green and silver mix with some multicoloured sparkle. I am also showing you a new P2 polish I picked up called Summer Lovin' and I am also using some stencils again from She Sells Seashells! Do you want to see how I combined all these goodies? First up is Sophie. 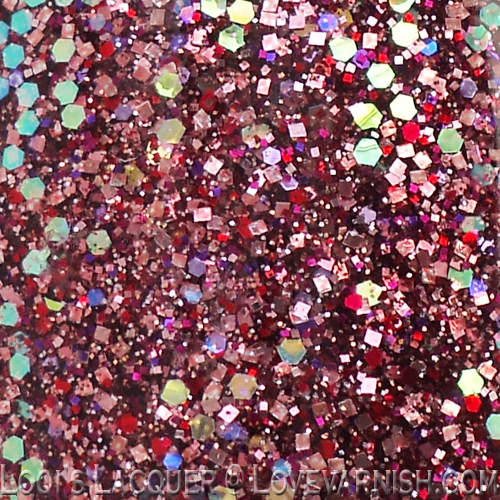 Sophie is a very nice of pink, red and iridescent glitter. It's very cute! It has a clear base, so it's best to layer it over a base colour. For this I used a new polish I picked up a while ago from P2 called Summer Lovin'. 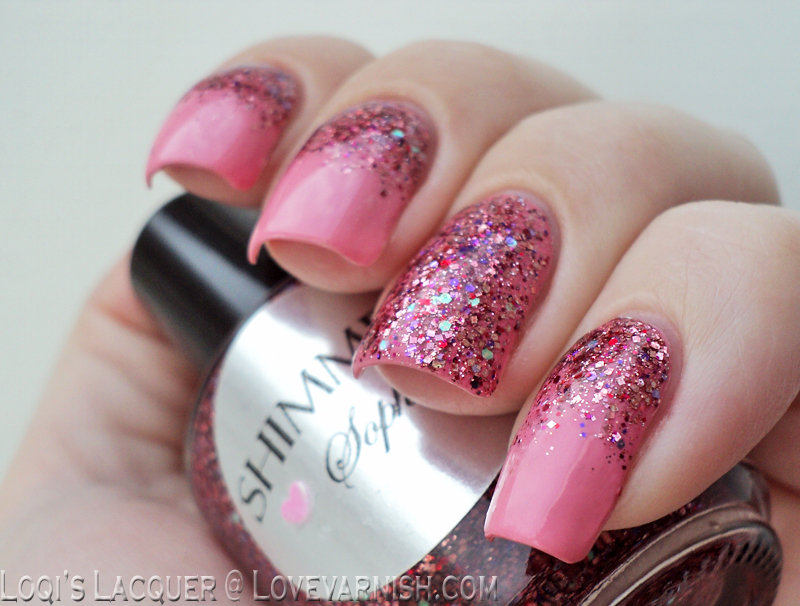 Summer Lovin' is a wonderful pink crème with a coral undertone. 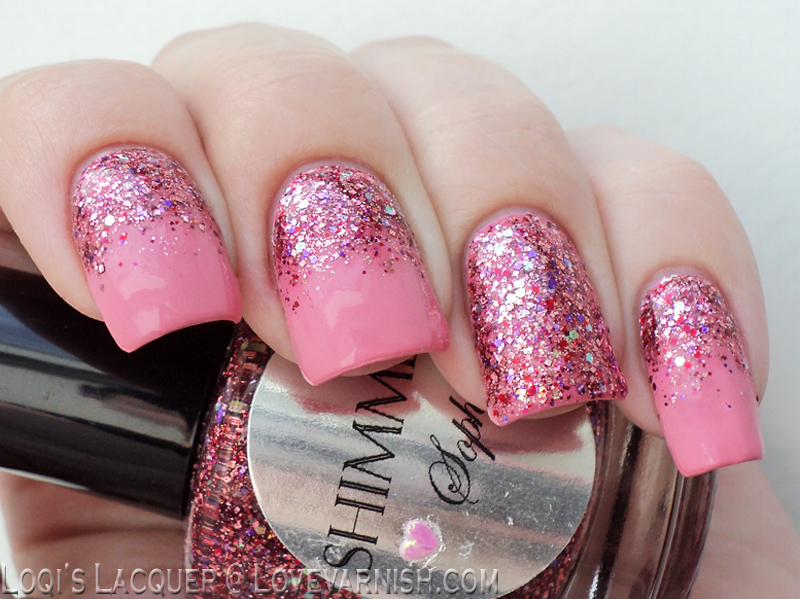 It has some pink shimmer in the bottle, but this sadly doesn't show on the nail. For this manicure I layered 3 coats of Sophie over 3 coats of Summer Lovin' on my ring fingers and thumbs and made a gradient on the other nails using the wiped off brush from Sophie. I really like both these polishes and the combination of them. Sophie is very cute and ideal for a more girly manicure. Summer Lovin' is kind of disappointing in how many coats it takes to get opaque but I love the coral undertone. 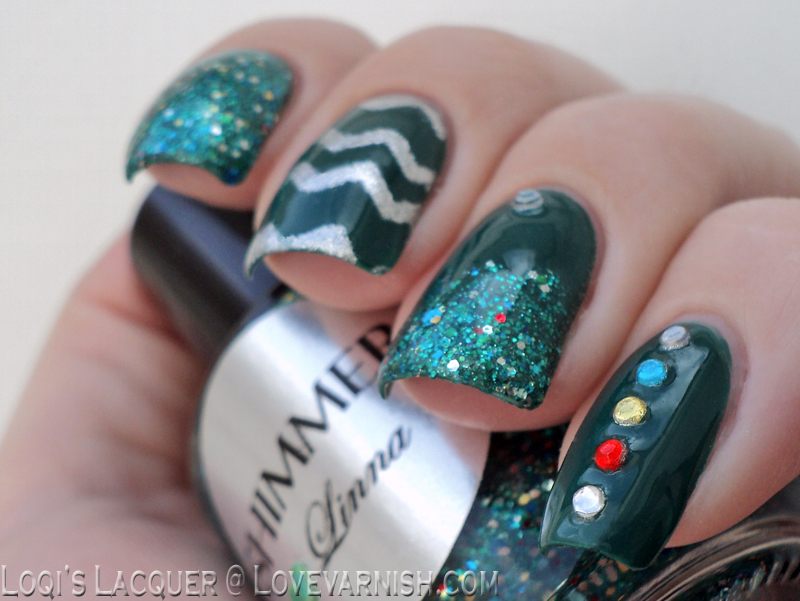 Linna is a very pretty combination of a teal leaning green with silver and a sprinkle of multicolored glitter. It's a very colourful mix but not 'over the top'. It also has a clear base, so again, I layered it for the best effect. The base colour I used for his manicure was Essence Trust in fashion and I used 3 coats of Linna for the index finger and thumb and made a gradient on my ring fingers. 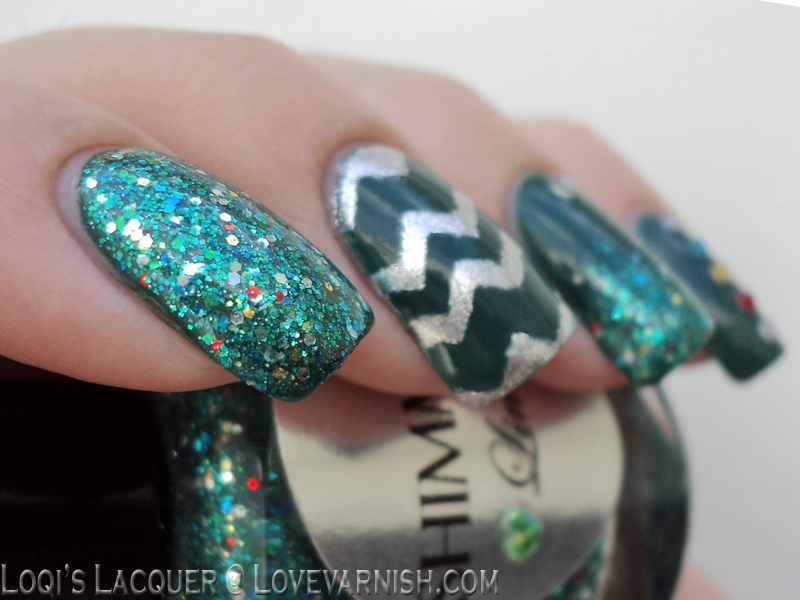 I also picked out the silver from the polish to do a chevron tape pattern. For this I used Sinful Colors Heavy metal and a set of nail vinyl stencils from She Sells Seashells in different sizes. As a finishing touch I applied some rhinestones in the same colours as the multicoloured glitter. I am really happy with how this manicure turned out. 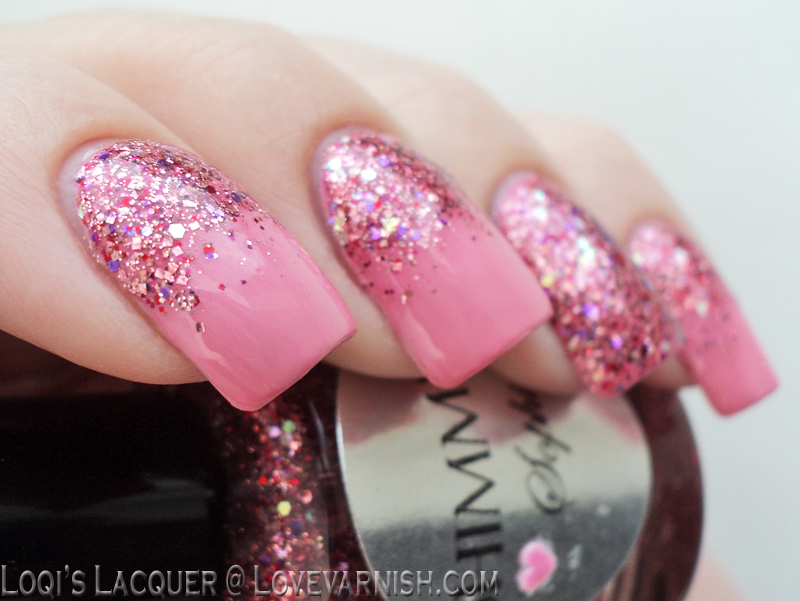 Linna is a gorgeous glittermix and the nail stencils work perfectly every time I use them. You can get these and other nail stencils over at She Sells Seashells. Shimmer polishes are available on their website or Etsy. That pink combo is so cute! And love what you did with the vinyls in the second look :). 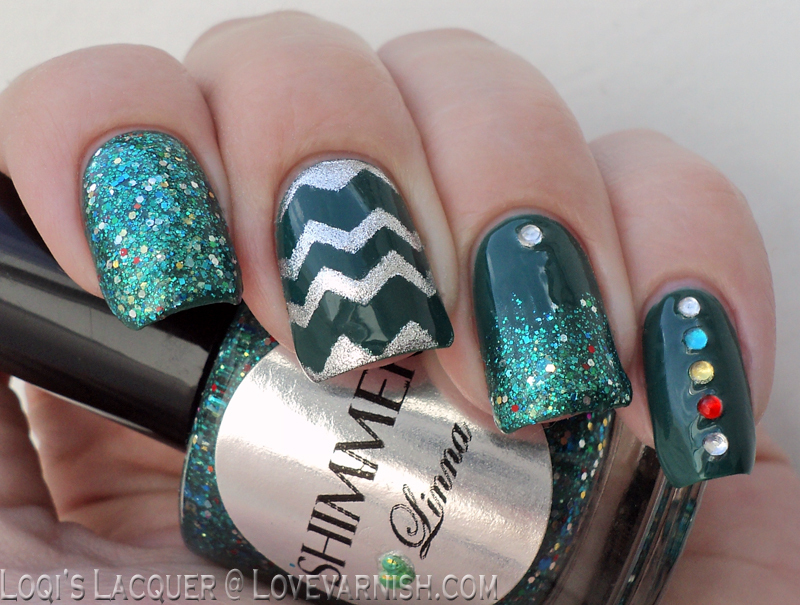 I love Shimmer Polish! Sophie looks gorgeous! Simply stunning and so full of art! I love both, the green one reminds me of Christmas. Thank you :) yes it does look a bit Chrismas-y doesn't it?